Analyses by Seattle scientists say hot, dry West Coast conditions and frigid East Coast weather are tied to warming in the Pacific, not Arctic melting. A gargantuan blob of warm water that’s been parked off the West Coast for 18 months is part of a larger pattern that helps explain California’s drought, Washington’s snow-starved ski resorts and record blizzards in New England, according to new analyses by Seattle scientists. The researchers aren’t convinced global warming is to blame, which puts them at odds with other experts who suspect Arctic melting upset the “polar vortex” and contributed to the misery on the East Coast the past two winters. 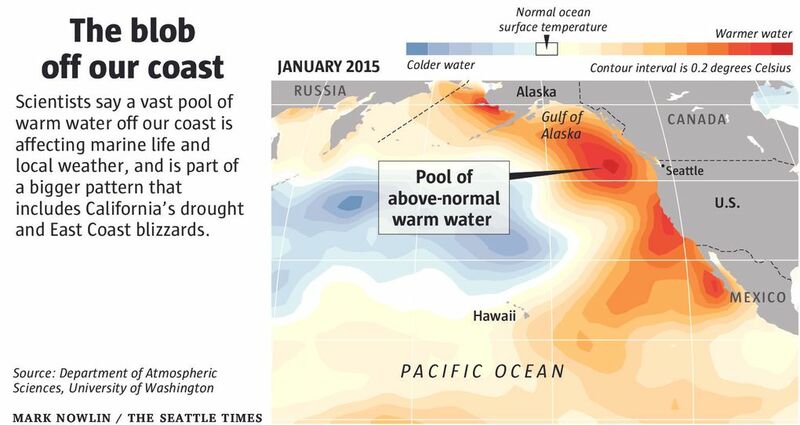 University of Washington climate scientist Nick Bond coined the term “The Blob” to describe the pool of water, up to 7 degrees Fahrenheit hotter than usual, that blossomed offshore in the fall of 2013. It’s still there, hundreds of miles wide and stretching from Alaska to Mexico. Average temperatures are now about 3.6 degrees above normal, and climate models predict the anomaly will persist through the end of the year. In a paper published in Geophysical Research Letters, Bond and his colleagues conclude that the blob has disrupted the marine ecosystem in multiple ways, triggering an influx of sunfish and other tropical species, lowering nutrient levels and contributing to the mass starvation of seabirds called Cassin’s auklets off Washington and Oregon this winter. In February 2014, the temperature spikes were the most extreme in at least 30 years, and possibly in more than a century. The researchers found that the presence of the blob also influenced Northwest weather by warming and humidifying onshore flows, which contributed to last year’s muggy summer and thunderstorms that sparked the biggest wildfire in state history. This winter’s meager snowfall is also partly attributable to the blob, Bond said. The warm water owes its existence to a long-lasting pressure ridge along the coast, the scientists found. Usually, wind cools the sea in winter, but the ridge has dampened that flow. Taking a more global view, UW atmospheric scientist Dennis Hartmann concluded in a separate paper that the ultimate cause of both the blob and the ridge lies far to the south, in the equatorial Pacific off New Guinea. The water there has also been unusually warm in recent years, setting up a situation similar to the El Niño phenomenon, but on a smaller scale and in a different corner of the ocean. Japanese scientists call it a pseudo-El Niño, while others use the term North Pacific mode because the warm water extends northward along the California coast. Like El Niño, the current pattern can have far-reaching effects on weather patterns around the globe. Looking through meteorological records, Hartmann found that the North Pacific mode is closely linked with high pressure over North America. And when he entered sea temperature data from the past two winters into climate models, the results were high-pressure ridges very similar to those of recent years. The pattern is a natural one, and there’s no convincing evidence yet that global warming is making it more severe, Hartmann said. He also discounted the impact of melting ice in the Arctic. “My work provides an alternative explanation for the cold winters of the past two years,” he said. Rutgers University research professor Jennifer Francis is among those who argue that Arctic melting destabilizes the wind pattern called the polar vortex, which normally confines frigid air to the planet’s far north. The result is a weakened jet stream with kinks that can deliver extreme weather where it’s not expected. Francis said there’s no doubt ocean temperatures in the tropics play a role, but she thinks Hartmann is wrong to leave the Arctic out of the equation. There’s good evidence that rapid warming near the North Pole intensifies high-pressure ridges, setting the stage for odd and long-lasting weather patterns. Models suggest that as the globe warms, the region will see higher temperatures in the winter and precipitation levels that are about the same or perhaps a bit higher. However, most of the moisture will come as rain, not snow. 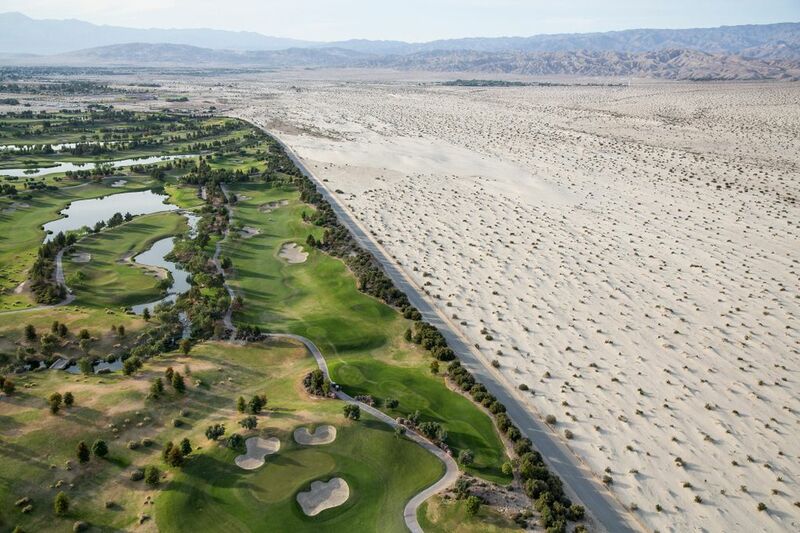 One promising note for parched Californians is that a real El Niño often follows in the wake of a pseudo-El Niño.